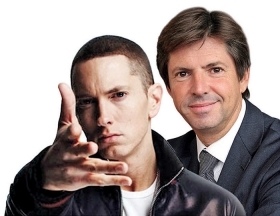 Olivier Francois, right, landed rapper Eminem with a pitch to his Detroit roots. Joel Martin, principal of Eight Mile Style Music and co-owner of Eminem's song catalog, is used to getting the cold shoulder from Michigan automakers, who generally have found the rap artist's song lyrics too spicy for their mainstream audiences and family cars. So imagine his surprise when he got a call on his cell phone one day last December from an assistant at his suburban Detroit office: "The president of Chrysler is here looking for you." The assistant didn't have it quite right. Olivier Francois is CEO of the Chrysler brand, as well as chief marketing officer for all of Chrysler, which includes Dodge, Jeep and Ram brands, He's also CEO of Fiat's Lancia brand in Europe and chief marketing officer of Fiat. And to know how Francois operates is to know that it was very much in character for him to drive over to Martin's office with no appointment, hoping, or even expecting, that Martin would be there to discuss using a classic Eminem song, "Lose Yourself," in a Super Bowl commercial. In the end, the meeting took place at 10 p.m. on a Sunday over coffee. Francois, 49, on the job at Chrysler for 15 months, is gaining a reputation among ad agencies, dealers and his staff for surprising them and taking the kinds of risks that make them feel more confident than they ever did while owned by German automaker Daimler AG or private equity firm Cerberus Capital Management. His latest roll of the dice was a two-minute, $9 million Super Bowl spot, featuring Eminem's anthem and the rap star himself, to launch a new strategy and tag line around the Chrysler brand: "Imported From Detroit." "He's a maniac," Martin said of Francois, noting that Martin and Eminem turned down more than 100 deals to use the song in commercials before agreeing to sell it to Chrysler. "The whole thing had a surreal quality to it... This French guy and all this he was telling us about loving Detroit and how important Marshall [Eminem] is to the city." If it weren't for Francois' salesmanship, "We never would have done it," Martin said. While the gambit took a lot of commercial-watchers and critics off guard, the idea of featuring the city of Detroit and playing up the heritage and history of making cars is not a new idea. "This idea has come up for Chrysler, Chevrolet and Pontiac a handful of times in the last 20 years," said Gary Topolewski, an independent creative director who has worked on Chrysler, Dodge, Jeep, Buick and others over his career. "But it always got shot down by the executives who have worked in Detroit their whole lives, fearing it wouldn't play on the coasts." But Francois greenlighted the idea, which originated with Portland, Ore., agency Wieden + Kennedy. "Maybe it takes people from outside the city to see the possibilities and passion," Francois said. Of the four brands he took over, Chrysler has been the biggest challenge. It is not generally viewed as a luxury brand. But he is positioning it as "new" luxury. "Beautiful, passionate design and comfort for people who don't forget where they came from," said the Paris-born Francois, who thought he would enter the diplomatic corps after getting a political science degree in the late 1980s. An advertising and marketing degree from Sorbonnes Celsa, though, led him to Citroen, then Fiat. When Fiat took control of Chrysler after the federally assisted bankruptcy, it didn't take long for Francois to hit on the need to change the way the company thought about its messaging. Longtime agency BBDO was served notice after working on Chrysler business for 65 years. A review ensued in which agencies had to prepare strategies for Chrysler, Dodge and Ram truck brands. The Richards Group of Dallas won Ram; Fallon Worldwide took Chrysler and Wieden + Kennedy took on Dodge. Global Hue retained Jeep and multicultural duties. Since then, Francois has restructured things, separating agencies by job rather than brand. Wieden now leads on all national branding for Chrysler, Dodge and Jeep. Doner, Southfield replaced Fallon when the latter resigned Chrysler to take on General Motors' Cadillac brand, and handles the retail-driven ads for all four brands. Richards retains Ram, with the thinking that the truck market is a unique ad space, and because Chrysler plans to introduce more models, such as commercial vans, under the Ram brand. And Global Hue handles multicultural ads on all four brands. "Things sorted themselves out based on which agency was doing the best job at each function, and I think we have a very good team in place now hitting on all cylinders," said Francois, who admits it can be tough for agencies to work with him because of how much he gets involved in the creative "as a creator." He is known for making fast decisions mostly on instinct. "Meetings tend to run fast, and ideas don't get a lot of wind-up," said Richards Group CEO Stan Richards. In November 2009, he approved putting "rip" videos -- mood videos created with stock photography and voiced by agency staff largely for internal use -- produced by Richards Group for Ram truck and Global Hue for Jeep on national TV as commercials despite low production values. "I was shocked, but I did not object," said Richards, whose voice was on the commercial, with a laugh. Last August, Francois approved an idea after just a few minutes of brainstorming with Wieden staffers on how to respond to protests from animal rights groups over the use of a chimp in a Dodge retail spot -- the chimp was removed, but the clothes he was wearing were left behind, giving the spot an odd "invisible chimp" effect. Not only was the People for Ethical Treatment of Animals pleased, but the new commercial went viral as the original hadn't. And for a July 4-timed Dodge spot, he approved a commercial showing George Washington leading a column of Continental soldiers into battle against British redcoats driving Dodge Challengers. "Some of our team had a lot of doubts, but I knew right away and approved it off the storyboards," Francois said. Advertising "American" for Detroit automakers has been a kind of taboo, especially since, until recently, they badly lagged Asians such as Toyota and Honda for quality and fuel economy. But Francois and his roster of agencies have injected images of Americana and messages of American pride and values of hard work and reward into Chrysler, Dodge and Jeep advertising. "We're from America," the Super Bowl spot proclaimed. "The things that make us American are the things we make," the Jeep spots say. Francois hints that he has much more in store to link the Chrysler brand to the comeback of the city of Detroit in which he wants Chrysler to be a key player. "You can do this sort of thing very badly," said Dennis Keene, an independent marketing consultant. "But I have to say that Chrysler is bringing so much art to the messaging that I think it flies, though they are walking right on the line." Doner CEO David Demuth says working with Francois is "like working with a creative director on the client side." He doesn't just approve or reject ideas or storyboards like most chief marketing officers. Trained early in his life in music, for example, Francois sits with composers and tells them exactly what he wants or is looking for. For the Super Bowl spot, he worked with composer Luis Resto on the adaptation of "Lose Yourself." The ad did not include Eminem's lyrics, just the music. Wieden cast Detroit gospel choir Selected By God to perform in the Super Bowl spot, but it was Francois, according to Resto, who directed what they sang, directing the crescendo leading into Eminem's line: "This is the Motor City. This is what we do." Added Resto, "I mean how many car marketing guys can sit down and tell you why he wants a 'melancholy piano,' ... that was a first for me." Indeed, Francois, who does not play piano, nevertheless has composed or co-composed music for numerous Lancia and Fiat spots. He gets no royalty or other extra payments. What he's doing is importing the strategy to Chrysler that he has long used in Europe on Lancia commercials. "You've got to tell stories that grab people by the collar, and that's what we try to do," Francois said. In a 2007 spot for Lancia, he approached fashion designer and gay icon Stefano Gabbana to appear in the commercial. Gabbana initially refused. But after Francois laid out the storyline of the spot in which Gabbana, driving a Lancia Delta, would be tempted by a beautiful woman and would end up in a passionate kiss, he not only agreed, but did it for no fee. The commercial created a publicity sensation in Europe and a sequel was produced. Francois coyly said he does not like to use "spokespeople." But his two ever-present BlackBerrys run deep with celebrities who have appeared in his spots: Carla Bruni Sarkozy, Richard Gere and even the Dalai Lama have appeared in Lancia commercials. Of those, only Gere took a fee, and it was for his charity. Even Eminem sold Chrysler rights to his song for 20 percent of what he could have gotten just to be part of the spot. Oscar-winning actor Adrien Brody directed a Chrysler spot late last year, his commercial directing debut, and voiced the spot as well. Clearly Francois doesn't mind poking at beehives. He launched the Richard Gere commercial spotlighting the plight of Tibet the week the Beijing Olympics kicked off. And he created Lancia spots the past three years to spotlight the imprisonment of Nobel Peace Laureate Aung San Suu Kyi to run the week of the annual World Summit of Nobel Peace Laureates in November. The commercials show laureates arriving in Lancias, and close with a Lancia's rear door opening with no laureate riding in the back seat, representing Suu Kyi's absence. Last November, he was editing the latest when he got word Suu Kyi would be released, necessitating some fast changes to the spot, which he directed from a Delta Airlines flight. "The ads only work with these famous people if they are within a story that makes sense to who they are and for the brand," Francois said. Given his track record, few doubt Francois' ability to get attention for Chrysler's slowly recovering brands. The Super Bowl spot, for example, generated more online buzz and news coverage than Chevy's five commercials combined. Ralph Gilles, Dodge brand CEO, defends Francois' penchant for risk taking. "People get all the product information they need online... The role of the ads should be to light a fire under them, and drive them online to check us out," Gilles said. But he has to turn those bursts of attention into sales and favorable opinion. Chrysler's retail market share before Fiat took it over in 2009 was 8.9 percent, according to Automotive News figures, and by 2010, it hit 9.4 percent. Francois cranked up Citroen's sales in Italy the three years he ran the business there, more than doubling market share to 6.5 percent. The Chrysler-Fiat team has worked at breakneck pace since summer 2009 to make dramatic improvements to core vehicles such as the Chrysler 300 and 200, as well as the Town & Country minivan, Dodge Charger and Challenger, Jeep Wrangler and Compass. The automaker has emphasized improvements to interiors, which were rendered the worst in the industry by Daimler in its waning days of ownership, and then by Cerberus Capital Management. The 300 makeover alone cost $1 billion. "We are no longer ashamed of the products we are selling," a brutally frank Chrysler CEO Sergio Marchionne said about the Chrysler-Dodge-Jeep showroom he inherited. The biggest obstacle to buying Chryslers are the mostly terrible quality ratings from Consumer Reports and J.D. Power and Associates, which tracks initial quality and long-term dependability. The makeover has corrected many problems, but it will take two to three years for the automaker's ratings to improve and reflect the changes because of how the organizations work their rankings, and even longer for consumers to trust. For this reason, a lot of Chrysler's retail advertising is using positive quotes from auto industry media already impressed with the changes. Chrysler plans to launch an initial public offering in the fall. It's imperative that institutional investors and stock analysts believe Marchionne's senior team and operation are headed in the right direction. Not only do retail sales need to climb in order to impress investors, but the overall operation, from product to marketing, needs to have credibility with investors and the public. Last year, Francois commissioned a corporate ad effort from Gotham, New York, but decided not to run it, deciding instead to plow the money into the Jeep Grand Cherokee launch. That, one Chrysler insider said, shows he is not a foreigner operating in a strange land. Said the subordinate: "He knows where the priorities are -- sales."